Stainless steel drainage channel with trapezoid-shaped perforations. Used externally to prevent water accumulation at thresholds and facilitate area drainage. Drainage channel with stainless steel trough and galvanised steel grate. Used externally to prevent water accumulation at thresholds and facilitate area drainage. Particularly suitable for high water volumes. Drainage channel with stainless steel trough and polished stainless steel grate. Used externally to prevent water accumulation at thresholds and facilitate area drainage. Particularly suitable for high water volumes. 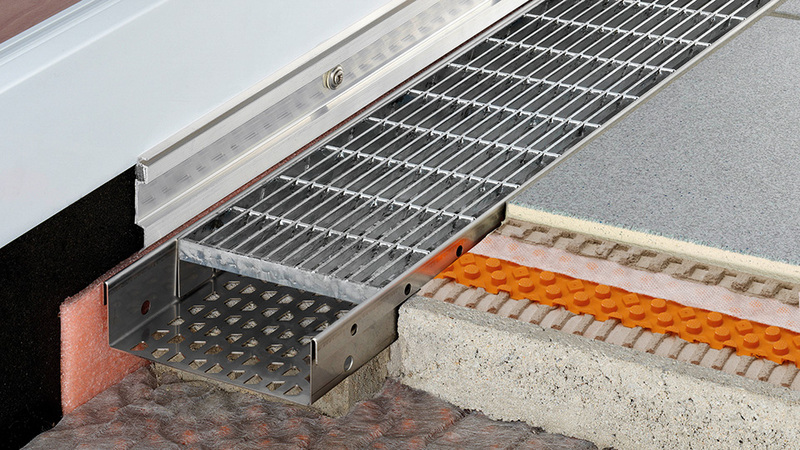 Stainless steel gravel-retaining angle for use at the edge of coverings or load distribution layers. Colour-coated aluminium profile with drip edge. Profile is installed over a finished sloped screed and allows for the installation of tiles with an overhang.